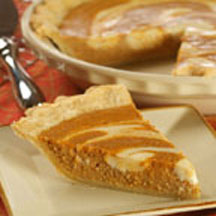 Swirls of sweetened cream cheese add a delightful presentation and creamy flavor to this pumpkin pie. Beat cream cheese in small mixer bowl until light and fluffy. Gradually add 1/4 cup corn syrup and vanilla extract; beat until smooth. Combine pumpkin, evaporated milk, eggs, remaining corn syrup, sugar, pumpkin pie spice and salt in medium bowl. Pour into pie shell. Drop cream cheese mixture by rounded tablespoon onto pumpkin filling. Swirl mixture with spoon, pulling pumpkin mixture up to surface. Bake for 50 to 60 minutes or until knife inserted near center comes out clean. Cool completely on wire rack.